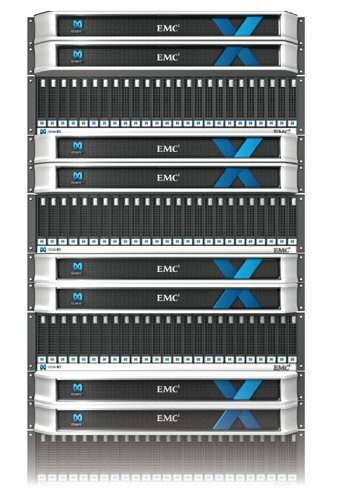 Mega-vendor EMC is going to launch its XtremIO all-flash array with general availability on 14 November. It has been on limited or directed availability for a few months and there's a fair amount of information coming out about it. Management through a GUI, vCenter plugin, CLI or REST API. Oddly, two X-Bricks take up 12U of rackspace but four take up only 22U. If an SSD fails the rebuild is distributed across other SSDs and is content-aware. For example, only user data is copied, not free space. XDP doesn’t require any configuration, nor does it need hot spare drives. Instead, we understand, it uses "hot spaces" – free space in the array. Data is stored in 4KB chunks using hashes. Hash comparisons are used for deduplication and hash values are used for distributing writes. We understand each controller runs its own copy of XIOS with the hash range distributed across XIOS copies – so hash value affects data placement. Data is only written when a full stripe exists. The idea is to reduce write levels and prevent host-spots developing. A front-end VPLEX box can be used to provide replication now, along with RecoverPoint. XtremIO may not get synchronous replication as that would affect performance. We’re told one X-Brick can support 2,000 or more (Citrix) virtual desktops. A reference architecture for XtremIO-supported virtual desktops can be found here (31-page PDF). A VMware View VDI reference architecture can be found here (30-page PDF) and it supports 7,000 virtual desktops. The document says 1,000 linked clones were deployed in 75 minutes. Two X-bricks were included in a Vblock Specialized System for Extreme Applications, with an 8-node Isilon S-Series NAS storage system for user data and Horizon View persona data, and 48 Cisco UCS server blades.